Are you considering applying for one of the Johns Hopkins nurse residency positions? If so, you’ve made a good choice. Johns Hopkins is one of the most well-known hospitals in the country. Its staff features some of the most experienced doctors and nurses, and the university has one of the top nursing programs. Its nursing school has been named one of the best graduate nursing programs in the country by U.S. News and World Report. Once you’ve completed your degree at Johns Hopkins, you may want to do a year of residency work before starting your full-time career as a nurse. While you can do your residency anywhere (and prepare your residency letter of recommendations), Johns Hopkins Hospital does have several different programs options you may want to apply do. If you’ve enjoyed your time in Baltimore and would like to spend another year in the city while doing a residency, there’s a lot Johns Hopkins can offer you. Of course, you first have to be accepted. Even if you graduated from their nursing school, you still must apply and beat out the many other nurses who want to spend their residency at Johns Hopkins. That means you need an outstanding personal statement. Johns Hopkins University is located in Baltimore, Maryland. The university was named after Johns Hopkins, a philanthropist who lived in the 19th century. One of his major areas of focus was on public health, and he gave $7 million dollars to create the hospital and university. His gift was, at the time, the largest bequest ever made in the country. Check out other nurse residency programs in California by clicking here! The university enrolled its first students in 1876. The hospital, School of Nursing, and School of Medicine opened shortly thereafter. Today, there are over 21,000 students enrolled either full-time or part-time in the university’s nine different academic divisions. The university has also opened three other campuses plus has sister campuses in Italy and China. In addition to the schools of nursing and medicine, the university is also home to the School of Advanced International Studies, the Applied Physics Laboratory, the Krieger School of Arts and Sciences, the Carey Business School, the School of Education, the Whiting School of Engineering, the Peabody Institute, and the Bloomberg School of Public Health. Johns Hopkins university programs are known for their outstanding education. The university emphasizes research, and students often co-publish their work along with faculty members. A few of the many different works done at the university include authentication of the Dead Sea Schools, the invention of the supersonic ramjet engine, and the creation of the medication Dramamine. Following graduation, many nurses elect to do a one-year residency instead of entering the workforce right away. Doing so provides them with additional education, skills, and experience they can use to stand out from others. Having a residency on your resume will put you ahead of the competition when applying for nursing jobs. While students may do a residency at any hospital that offers one, a number of students who graduate from the university elect to do a Johns Hopkins nurse residency. These residencies are based on the idea of bridging the gap between the classroom and working as an RN. They provide nurses with help transitioning into a career and learning what it takes to be a full-time healthcare provider. The two residencies are split into several different areas of focus. One of these residency programs that many general nurses apply for is the adult track. This residency teaches new nurses how to work with adult patients in a variety of different tasks. It’s perfect for a nurse who wants to work in a hospital or in a private practice. Nurses learn hands-on skills under the supervision of a mentor who has years of experience in the industry. Another residency option is the PEDs track. This residency focuses on pediatrics and is great for graduates who want to help children. Nurses in this program will learn how to assist young patients by working with experienced practitioners. The residency has an innovative program that is unlike anything offered at other hospitals. The nursing program at Johns Hopkins is one of the best in the world. In fact, it’s ranked number one in the United States for graduate nursing programs. The program began in 1883 and has grown ever since. In 1998, it moved into a new building that includes state-of-the-art equipment and clinical classrooms. The nursing program has around 500 full time students and 700 part time. Around 400 of these students are in the undergraduate BSN program, while the others are taking graduate courses. The school employs 80 full time faculty, which creates a very low student to faculty ratio. This is especially true in labs and in clinical courses, where classes are often capped so that students get one-on-one time with their instructors. After graduating, students can find work anywhere in the country. While some do decide to apply to join the staff at the Johns Hopkins hospital, others return to their home states or move to other locations. Thanks to the prestige that the Johns Hopkins name brings with it, nurses who have graduated from the university or have completed a residency are already ahead of the competition. Graduates from Johns Hopkins work in areas across the United States, including rural and urban hospitals and doctor’s offices. Some even work internationally, joining programs such as Doctors without Borders. However, not all nurses actually work with patients. As a major research university, graduates do leave school with strong skills in lab work. Those who don’t want to work directly with patients may go into research. These nurses will work with others to discover new medications and life-saving surgical techniques. Discover what you need to know for writing internal medicine residency personal statement with tips provided by our specialists! Applying for admission to Johns Hopkins University can be done online. You’ll need to complete the online application and upload a number of other documents. You will need your high school transcripts and those from any college you’ve attended, even if you only took one or two classes there. You will also need to write a personal statement. This statement is often the key part of your application. Many students who apply here are at the top of their class, so the personal statement is what will set you apart from them. You want to make sure it’s error-free and well-written. When applying, always make certain that you know when the deadline is so that you can submit your completed application on time. If you miss the deadline, your application may be discarded without ever being read. In addition to the personal statement and application fee, a number of other things are required. Applying does require students to pay a $70 nonrefundable application fee when they submit their complete application. This fee can be paid online for those submitting their application through the internet. They will also need to have two of their teachers submit letters of recommendation. Teachers will need to either mail these letters to the correct address or submit them electronically following the instructions provided. Students who are mailing their completed application may include the letters, but they must be sealed shut. Students who apply may take either the ACT or the SAT. These tests are held periodically throughout the year. You’ll want to make sure you have time to get your scores back before the application deadline. Otherwise, you may have to either select another university or delay starting your college career for a semester or a year. Even with high scores on the ACT or SAT and outstanding recommendation letters, students may still not be accepted. Only about 11% of all applicants are accepted each year. This means that the large majority who apply will not get in. Residencies at the hospital are just as competitive, with the majority of applicants being rejected. The School of Nursing graduates have an 89% NCLEX pass rate. Over 31% of all students are minorities. Some of these students do come from other countries. Over 11% of nursing students are male. The average ACT score of students admitted to the university is 32. Are you ready to apply to the university or to a Johns Hopkins nurse residency? If so, you’ll want to prepare an outstanding application. Both university students and residency nurses will need to write a strong personal statement. If you’re not adept at writing such type of documents, we can assist you with creating an outstanding personal statement that may be the one thing that sets you apart from other applicants. Rely your worries about your application process on professional residency personal statement service. Our writers have undergone through screening before hiring so we guarantee the highest quality personal statements for John Hopkins university programs or any other residency programs. The groundwork of our success is a blend of creative approaches to describe your personality characteristics and experience and our high implementation standards of getting the best result possible! 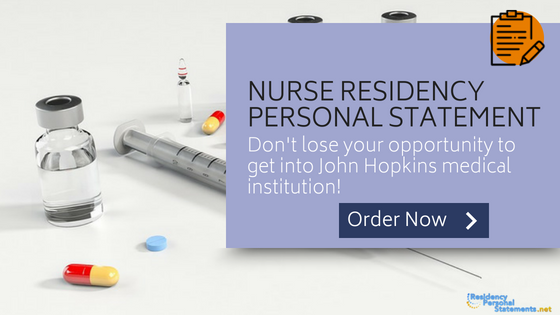 Don’t delay your application to Johns Hopkins nurse residency program and contact our writers to get professional help right away!